Just like with all the other social networks, successful users mix these two up. Content curation means you find things online to share. With Twitter and Facebook, LinkedIn and Google Plus, most of the time these things will be blog posts. Content Creation means writing and posting your own articles – which can be your own unique statement status updates, but really would be blog posts. The idea is, if you spend time on social media talking to people, sharing what they post, and then finding new things to share, you cover all the bases and are more likely to be paid attention to – when you create your own content! So, bringing this back to Pinterest – like all the networks it’s important to put a little bit of time setting up your profile. You can then browse other people’s boards, “repin” or “like” things you want to share. If you are active you will see pretty soon, people will repin and share your stuff too. Quality still counts – you need to make an effort to find things to share that you know would represent you. If you are in business, think of it as part of your online profile. Like all social media tools, it’s not there to “sell” for you. But you can use it to showcase your work, your taste, your approach to live, and raise awareness. Then it’s up to you if you want to use it to network, proactively, or if you would like to share your boards on other social networks (for example I have shared my Owl board on Facebook and Twitter and many of my existing contacts have followed me on Pinterest as well. 3. You think it’s worth people’s time. Within each board, you can include your own portfolio work (or visual representations of your own work). Think about themes and how this board will appeal to others. Look at others and see how they do it, and if you see anyone who you feel has the same tastes as you, reach out and say hi! 4. Come back here and comment on how you find it! How Snowbizz transformed their marketing – after only a few sessions of digital marketing and social media training! I’ve been signed up to Pinterest for a good few months but haven’t really made the most of its capabilities, having only pinned a handful of [beautiful] images which have taken my fancy – I call my board ‘Desk & Office Envy’. Your post is a fab reminder of how I should make more of it – if only as place to collate digital tear sheets of things that inspire me. I love Pinterest, I’ve been sent a couple of invitations and it looks fabulous but being completely inept, I cannot seem to get the hang of it & I am desperate to do so! This is a really informative post. I’ve had Pinterest on my radar for a while but not really explored it. Now I feel like I want to! Please can I have one of those invites? I’ll pin your owls! Pinterest looks really interesting and worth exploring. Thanks for showcasing it in your blog, Keren (and can I have an invitation, please). Hey Keren – great post. Please could you invite me? Would love to join. I loved your insights into making social networking worthwhile – creating and curating – snappy soundbite too! Its the twitter platform, but for people to post what they’re grateful for. Please can I have an invite!! Thank you! Can you, please, invite me? Hello… I am starting as grafic artist and really would apreciate have a place to share stuff i like . Can u, please, send me and invitation for PINTEREST? Thanks !! 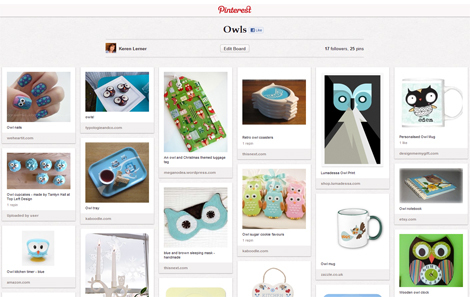 I love your owl board – and have seen some great fabric and knitting boards too… yes, I know, it’s becoming obsessive!